All around the world, marriages are failing in their millions. Yet God can help, if you let him into your life. Aspects of Marriage will help you to understand why your marriage is failing and how, with God’s help, you can make it work. It will also help you to know what to do when you are called to provide wise counsel to a couple experiencing a failing marriage. When Pastor Oghenethoja Umuteme heard God calling him to write a book on marriage he set to work without delay. Having spoken to many people enduring marital problems, he found that problems often start at the beginning with a marriage which was not founded properly in God’s eyes. 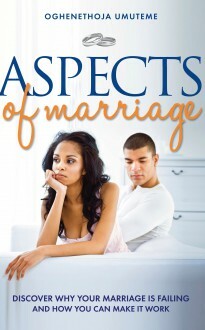 Aspects of Marriage goes to the heart of all kinds of marriage problems and will help any couple to understand what is going wrong and why, and how they can take the path to a happier and more fulfilling Christian marriage.